Lets now check the daily chart of Nifty. We have seen the support breakdown happened below 7540. Bearish MACD indicator shows the downside strength. 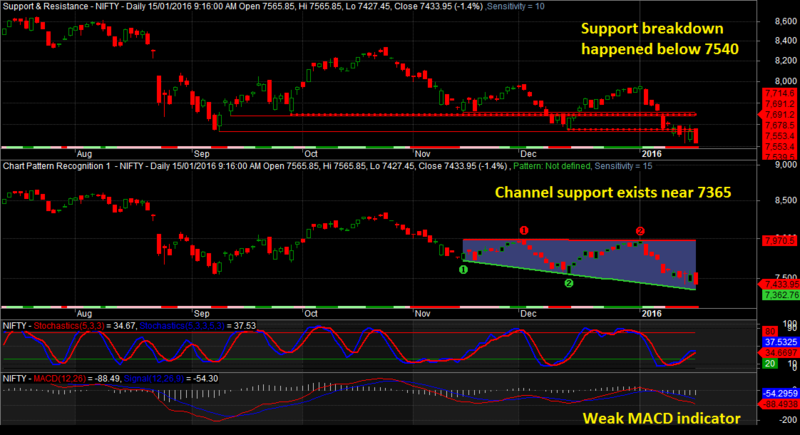 Channel support on daily chart comes around 7365 zone and this channel support is dynamic, i.e. will decrease with time. Lets now check the weekly chart of Nifty. We have seen confirmed support breakdown happened below 7540. Bearish Stochastics and MACD indicator shows the downside strength. 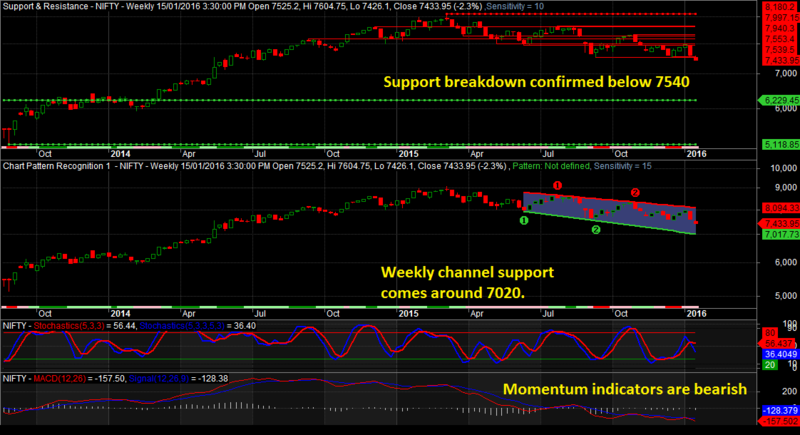 Channel support on weekly chart comes around 7020 zone and this channel support is dynamic, i.e. will decrease with time. Lets finally check the monthly chart of Nifty. The monthly chart support comes at 6357. Bearish Stochastics and MACD indicator shows the downside strength. 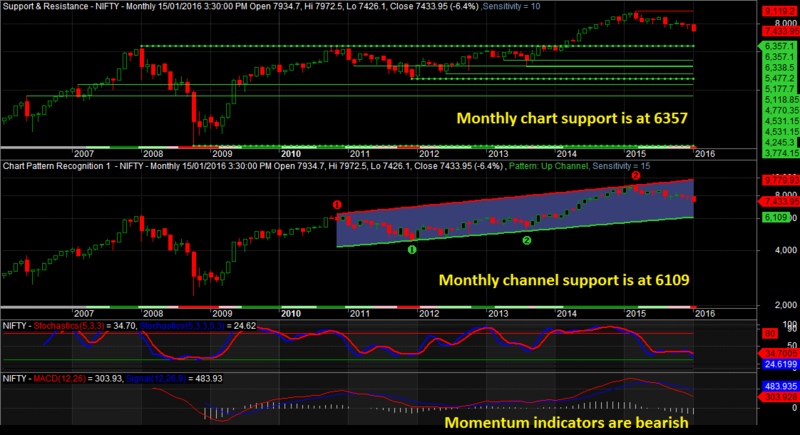 Channel support on monthly chart comes around 6109 zone and this channel support is dynamic, i.e. will increase with time. So only in monthly chart we are in an uptrend channel, rest daily and weekly charts shows we are in confirmed downtrend. So how to trade Nifty now? Here are my 4 top Nifty trading techniques for the first 3 months of 2016. We are in confirmed downtrend in daily and weekly charts. Short term players Nifty trading techniques should be to sell in rallies with a stop loss of 8000. Short term players, no bottom fishing please. Long term uptrend in monthly chart is still intact. So have an eye on good stocks those are out-performing the market, as in any bounce back these scrips will lead the show. Some stocks that can be real good to accumulate in further dips are – ASIANPAINT (CMP 882.30), BPCL (CMP 930.60) and RELIANCE (CMP 1072.60). Grab them in sharp dips of Nifty. If you have some more stock ideas I would like to have your comment below the post.